Thailand’s national debt is equal to the country’s public debt. The debts of the public sector do not ordinarily count as part of the national debt. However, there are a number of sinking funds maintained by the government, which aim to eradicate the debts of the country’s banking sector. This fund is still be run down from the bank rescue that the government performed in the 1997 Asian Financial Crisis. Thailand’s national debt stood at 41.9% of GDP at the end of 2017, according to the International Monetary Fund (IMF). This is a low level, which is typical of emerging Asian economies. Is Thailand’s national debt rising? Economists are more interested in a country’s debt in relation to its annual income. The metric that expresses national income is called Gross Domestic Product (GDP) and the relationship between debt and income is called the “debt to GDP ratio.” This measure is expressed as a percentage. 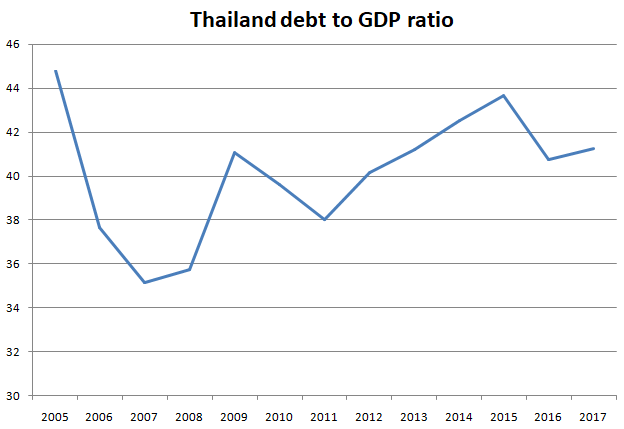 The debt to GDP ratio of Thailand peaked in 2015, as shown in the graph below. The ratio fell twice earlier in the century. However, that ratio is the interplay between debt and income, so when the GDP raises, existing debt fall as a percentage of the national income. So, for the debt to GDP ratio to rise, the nation’s debts would have to increase aa a faster rate than GDP. Thailand has had two periods this century when GDP did not increase year on year. These dips in GDP correspond with spikes in the debt to GDP ratio. In fact, the debt has risen steadily every year as shown in the graph below. In 1997 a collapse in the value of the Thai currency, the baht, drove more than 50 financials in the country institutions towards bankruptcy. The government took a loan from the IMF of US$14.1 billion. The government created a “bad bank,” called the Financial Institutions Development Fund (FIDF), which took over the debts and the loans of the country’s banks to enable the country’s banking sector to survive. The FIDF provides depositor insurance to the country’s banks and also pays down the remaining debt from the 1997 crisis. The FIDF acquired holdings in the rescued banks in exchange for assistance. Most of those shareholdings have now been sold off in order to help pay down the FIDF-managed debt. The Fund still owns 55.05% of Krung Thai Bank PCL. The FIDF is now financed through the levy payments made by the country’s banks and a special FIDF bond, issued by the Bank of Thailand. The FIDF is no longer issuing bonds to raise funds. 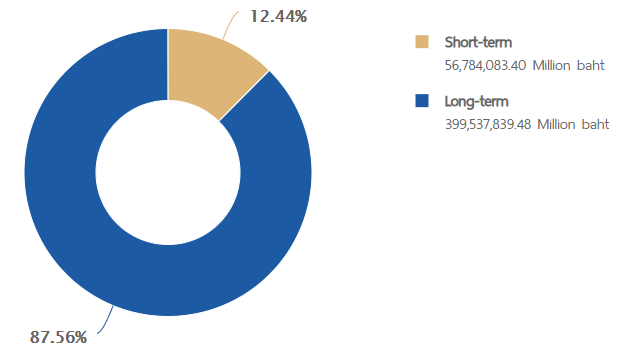 There is still 864,437.21 million baht in these bonds still outstanding. In US Dollars, that figure works out at $26,386.97 million. The Thai government includes the FIDF bonds in its calculation of the public debt. The FIDF borrowings represent 16.1% of Thailand’s national debt. What is Thailand’s credit rating? Thailand had an A-grade credit rating from all of the major credit rating agencies, but lost those in the crisis 0f 1997. Thailand was the epicenter of the 1997 financial crisis, which rolled out to damage the whole of South-East Asia. Thailand has the second largest economy of South-East Asia and so problems in its economy have a great deal of influence on global financial markets, so international economic institutions and the financial community keep a close watch on developments in the country. The table below shows the current credit rating of Thailand from the world’s top three agencies. The stable outlook shows that none of these agencies foresee altering these ratings in the near future. Who manages Thailand’s national debt? The Ministry of Finance sets the government’s budget. It is from this budget that the debt requirement arises. The Ministry of Finance also designs any bailout packages, negotiates IMF assistance, and decides on government fiscal policy. So, all of the factors that could reduce or increase the national debt are in the hands of the Ministry. The Ministry doesn’t manage the national debt directly. That job is the responsibility of the Public Debt Management Office, which was founded in 1999. How does the Thai government raise debt? New bonds are sold by the Bank of Thailand, which is the country’s central bank. The Bank hold auctions, to which only pre-approved buyers are allowed attendance. This is termed the “primary market” for government securities. Those approved buyers are called “Primary Dealers” and they are market makers. They are expected to resell those bonds on the secondary market, making them available to all traders. 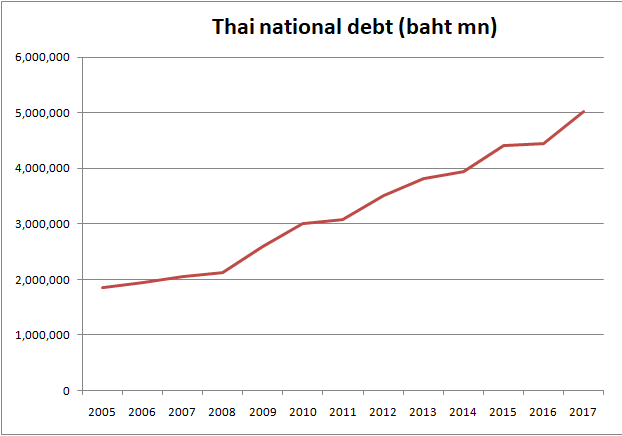 Long-term financing provides the largest part of Thailand’s national debt. Short-term financing is sourced through Treasury bonds. These instruments do not pay any interest, but are sold at a discount and paid back at face value. All Treasury bill have maturity dates of less than a year. The Thai government currently issues Treasury bills with maturities of 28 days, 91 days, and 182 days. Thai government bonds that are currently in circulation have maturities of 1, 2, 3, 5, 7, 10, 12, 14, 15, 16, and 20 years. The government issues both fixed rate and floating rate bonds. Typically, Thai government bonds pay interest twice a year — at six month intervals. What facts should you know about Thailand's national debt? You could wrap $1 bills around the Earth 598 times with the debt amount. If you lay $1 bills on top of each other they would make a pile 16,784 km, or 10,429 miles high.